Boyd Beef Cattle is a family owned operation located in the rolling hills of North Central Kentucky. The Boyd family has been raising registered cattle for over 100 years. 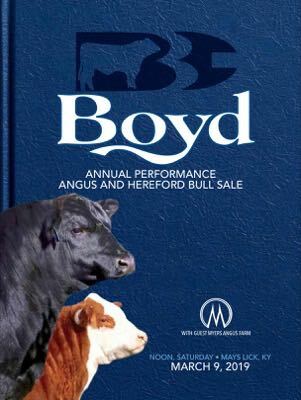 After four generations of the family being totally committed to the Hereford breed, Charlie Boyd II set out in 1992 to develop and establish the Angus herd at Boyd Beef Cattle to national prominence. The breeding philosophy is one with principal and discipline. Chasing the latest fads have and will not be the key ingredients to the program and its customers. The philosophy to identify and develop cow families based on the economically important traits has been the standard instead of the rule. Only the use of high accuracy proven A.I. sires has been implemented to complement these cow families. Both using the large and reliable database available from the American Angus Association & American Hereford Association, as well as strict visual appraisal have allowed the program to have success. Our performance bull sale is the second Saturday in March, every year; We sell 125 bulls annually via the sale and also private treaty. With our commercial bull customers always in mind, there are also a good percentage of bulls that sell to progressive registered operations. Every two years the Boyd Family hosts its Elite Angus Female Sale on the fourth Saturday in September. That offering consists of donor cows, heifer calves, bred heifers and embryo packages. Every other year, the Boyd Breeder’s Cup Angus Female Sale is held, where customers & guests are also able to merchandise their genetics. Annually, on the Saturday of Labor Day weekend, the Boyd Family hosts the Boyd Breeder’s Cup Hereford Female Sale. This venue also includes customers & guests, and offers a wide variety of genetics. Charlie II, his wife Paula, along with their two sons, Blake and Logan, are very active in Angus events, both on a state and national level. At the 2005 National Junior Angus Show in Denver, Colorado, Blake exhibited the Grand Champion Bred & Owned Heifer. Charlie I & his wife Martha take the lead in the Hereford events and continue to grow their deep roots in the breed. Their legacy in the Hereford industry for prominence of genetics and number of individuals that have made a true impact will be long lasting. Friendships and customer service are two vital areas that the Boyd family treasures deeply.